علوی تبار, هدایت. (1396). زندگی پس از مرگ. دوفصلنامه علمی پژوهشی حکمت اسرا, 9(1), 189-237. هدایت علوی تبار. "زندگی پس از مرگ". دوفصلنامه علمی پژوهشی حکمت اسرا, 9, 1, 1396, 189-237. علوی تبار, هدایت. (1396). 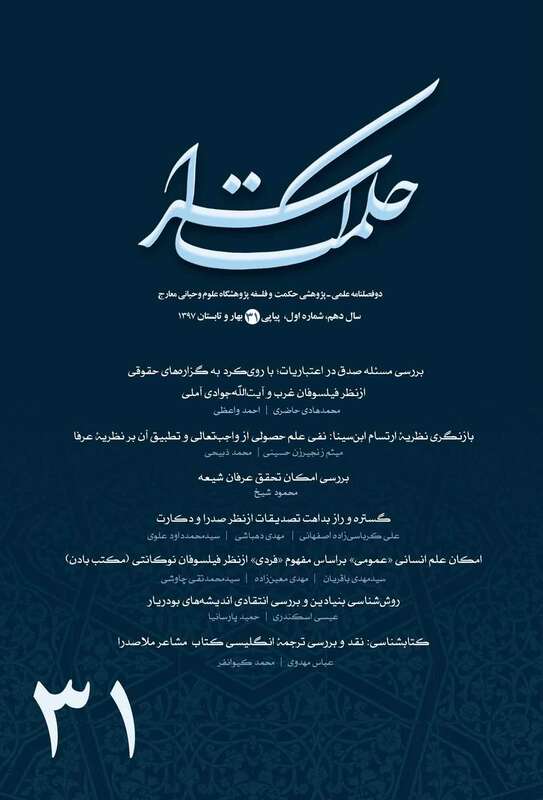 'زندگی پس از مرگ', دوفصلنامه علمی پژوهشی حکمت اسرا, 9(1), pp. 189-237. علوی تبار, هدایت. زندگی پس از مرگ. دوفصلنامه علمی پژوهشی حکمت اسرا, 1396; 9(1): 189-237. این مقاله پنج بخش دارد. در بخش اول دربارۀ اهمیت زندگی پس از مرگ بحث می‌شود. بخش دوم به امکان زندگی پس از مرگ از دیدگاه دوگانه‌انگاری میان نفس و بدن و بخش سوم به امکان زندگی پس از مرگ از دیدگاه مادی‌انگارانه اختصاص دارد. در بخش چهارم قرائن تجربی برای زندگی پس از مرگ بررسی می‌شود. در بخش پنجم دلایلی برای این نظر اقامه می‌شود که معقول بودن باورها دربارۀ زندگی پس از مرگ به معقول بودن اعتقادات مابعدالطبیعی وابسته است. There are five sections in this article. In the first, we discuss about the importance of afterlife. Section two considers the possibility of survival from the standpoint of mind-body dualism and section three deals with the possibility of survival on a materialistic view. Section four addresses the afterlife in terms of empirical evidence. In section five, reasons are advanced for thinking that the reasonability of beliefs about an afterlife depends on the reasonability of metaphysical convictions. Gallup, G. and W. Proctor, 1982, Adventures in immortality: a look beyond the threshold of death. New York, McGraw Hill, pp. 198–200. “Have you, yourself, ever been on the verge of death or had a ‘close call’ which involved any unusual experience at that time?”. Nationally 15% responded ”yes”. Habermas, Gary R., 1996, “Near Death Experiences and the Evidence—A Review Essay”, Christian Scholar’s Review, 26 (1): 78–85. –––, 2011, “Materialism and the Resurrection: Are the Prospects Improving?”, European Journal for the Philosophy of Religion, 3:1: 83–103. Heim, Albert von st. Gallen, 1892, “Notizen über den Tod durch absturz”, Jahrbuch des Schweizer Alpenclub, 27: 327–37. Trans. and Intro. by Roy Kletti and Russell Noyes, Jr., “The Experiences of Dying from Falls”, Omega, 3 (1972): 45–52. Kierkegaard, Søren, 1845, “At a Graveside”, Howard Hong and Edna Hong (trans. ), 1993, Three Discourses on Imagined Occasions, Princeton: Princeton University Press, pp. 69–102. Potts, Michael, 2002, “The Evidential Value of Near-Death Experiences for Belief in Life after Death”, Journal of Near-Death Studies, 20 (4): 233–258. Price, H.H., 1953, “Survival and the Idea of ‘Another World’”, Proceedings of the Society for Psychical Research, 50 (182): 1–25. Reprinted in John Hick (ed. ), 1970, Classical and Contemporary Readings in the Philosophy of Religion, second edition, Englewood Cliffs: Prentice-Hall, pp. 370–93. Page references to Hick 1970. Zimmerman, Dean A., 1999, “The Compatibility of Materialism and Survival: The ‘Falling Elevator’ Model”, Faith and Philosophy, 16 (2): 194–212. Preview the PDF version of this entry at the Friends of the SEP Societ.